If you’ve ever had really bad back pain, you know how awful it can be. Nothing feels right. But even worse, just for the sake of being gloomy, most of us don’t even know where our back pain is coming from! That’s a scary thought. Is it a nerve problem, like something being pinched? Is the pain caused by the disc itself? There are so many questions because our bodies are complicated machines. Living Well Medical in SoHo NYC is here to take care of questions like these for you, but for the sake of helping people learn more about their bodies, let’s explore the difference between the disc pain and a pinched nerve. A pinched nerve is just like it sounds: a nerve root being squished by a problem like a herniated disc. Pinched nerves don’t actually relate to pain in the disc space itself. In fact, the pain is often felt in parts of the body not directly in the problem area. We call this referred pain and it is often found in cases of radiculopathy (radicular pain, related to nerve roots). Pain in the legs, ankles and feet associated with sciatica is an example of referred pain from a pinched nerve. Unlike a pinched nerve, disc pain is felt precisely in the disc space. This might be the result of wear and tear to the disc itself causing a loss of disc height. Often age plays a critical role as well as the discs tend to have a tougher time retaining water with time. 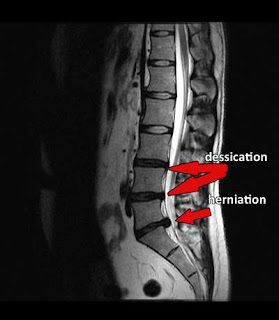 Degenerative Disc Disease is an example of direct disc pain. If we’ve gone so far as to say that the average person can’t tell the source of their pain, we might as well take it a step further towards being a downer: many of us have herniated or bulging discs and don’t even know it. That’s right! Not all disc irregularities are painful right away, but they may develop into a problem. So between all this scary back pain talk, there is a point - if you have pain or suspect a problem, come see a doctor who knows a thing or two about back, neck and joints. Chiropractors study the musculoskeletal system and can help you find some relief. The thing that really sets Living Well Medical apart is what we offer beyond just chiropractic. Physical therapy, massage, acupuncture, spinal decompression therapy, cold laser therapy, medical doctors, pain management - we have so many alternatives for pain relief that we can cater to almost anyone’s needs. If you live in NYC and are hurting, give us a call at Living Well Medical - 212-645-8151. The pain associated with disc injuries may range from mild to severe but frequently result in severe disabling pain and loss of function.